Joshua Li has maintained a strong and abiding interest in clinical-oriented research in the molecular biology of intervertebral disc and arthritis diseases. He got his M.D. and Ph.D. in China and received his postdoctoral training at the University of Virginia. He has received several prestigious awards including Kappa Delta Young Investigator Award. His research focuses on intervertebral disc degeneration and back pain. 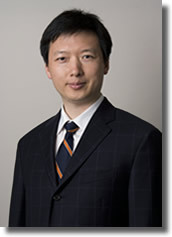 Because of his outstanding and productive research record, he has obtained over two-dozen grants for his research from the North American Spine Society (NASS), the AO-International Research Foundation, the Musculoskeletal Transplantation Foundation (MTF), Scoliosis Research Society, Cervical Spine Research Society and National Institute of Health. His laboratory is currently funded by a R01 grant to perform translational research.